The winery has incredible views of the Sacramento Valley and Coast Ranges. Located on a hill top the winery is able to capture the afternoon sun which allows the facility to be 100% solar. 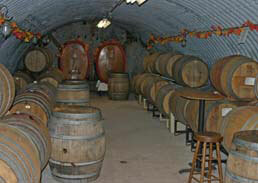 The facility was all built by hand, including the hand dug wine cave near the entrance to the tasting room. There is an outdoor eating area with patio tables and a picnic lunch with an outdoor kitchen coming soon. Don't let the long, but beautiful, drive prevent you from visiting, the winery is well worth the trip. 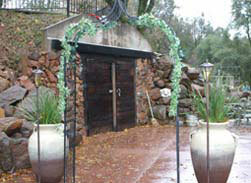 The estate is located on 45 breathtaking acres partially planted to Merlot and Zinfandel. Additional grapes are purchased from other Foothill vineyards, primarily from Nevada County. Sierra Knolls produces a nicely complex Cabernet Sauvignon with good acidity and balance that make it a good candidate to accompany dinner. They also make a fruit forward Zin from estate grapes that has a nice depth of fruit and a mouth filling body style. Winemaker John Chase creates small-batch, handcrafted wines for the Sierra Knolls estate. He is assisted in this endeavor by his wife Linda Chase, and partners Steve and Brenda Taylor. 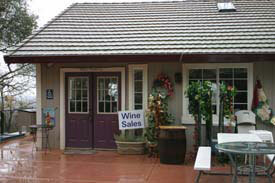 The partners were all home winemakers prior to opening Sierra Knolls.